A nappe is a large, sliver of rock that has been thrusted far from its original position (allochthonous) by thrust faulting during continental plate collisions. A thrust fault is a special case of low dip-angle fault that formed during regional compressional deformation. The folds associated with nappes are sheared to such an extent that they fold back over on themselves and break apart, producing large-scale recumbent folds of the hanging wall block. The underlying autochthonous (original, in-place) rocks are visible in tectonic windows beneath nappes when erosion removes the allochthonous rocks of the nappe. An isolated island of allochthonous nappe rock surrounded by autochthonous rock is termed a klippe. Nappes or nappe belts arose during the complex tectonic history of the European Alps. 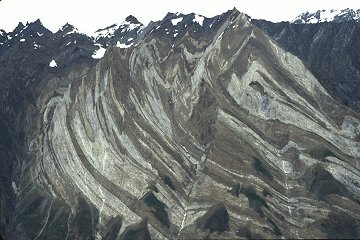 The Austroalpine nappes of the eastern Alps comprise three thrust faulted nappe stacks that lie atop three older Penninic nappes [Subalpine nappes].